Shop ticket holders feature strap with two magnets that secure together to form a hanging loop. Perfect for attaching to machinery, file cabinets, racking and more. Welded, non-rip seams for added durability. 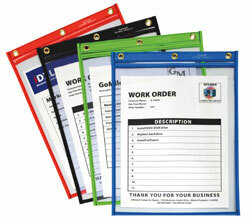 Clear vinyl allows for easy visibility and quick scanning of documents. Maximum loop diameter: 1 inch. Both sides clear. Holders open on short side. Size: 6 x 9. 15/BX. Learn about the wide variety of shop ticket holders at C-Line..